Surround yourself with chocolate in this Chocolate Fruit Tart. 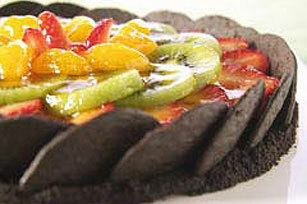 A crumb crust is filled with pudding and topped with fruit in our cool Chocolate Fruit Tart. Cut 10 wafers in half. Finely crush remaining wafers; mix with margarine. Press onto bottom of 9-inch springform pan. Stand halved wafers around edge of pan, overlapping edges slightly and pressing cut sides firmly into crumbs to secure. Bake 5 min. ; cool. Bring pudding mix, milk and cream to full rolling boil in saucepan on medium heat, stirring constantly. Pour into crust. Refrigerate 3 hours. Top with fruit. Heat preserves until melted; spoon over fruit. Refrigerate 1 hour. Garnish with fresh mint sprigs just before serving. Use serrated knife to cut wafers in half.